This pâté-style loaf provides complete, balanced nutrition and a source of moisture that can be beneficial to small dogs. Gram-for-gram, wet foods like the CESAR® brand have fewer calories than dry food. Paired with CESAR® Dry food, it makes a perfect meal for small dogs. Now you can add more diversity to your small dog's meals by picking up our convenient variety 12-pack! CESAR® Entrées Pork Tenderloin Flavour Food For Small Dogs is formulated to meet the nutritional levels established by the AAFCO Dog Food Nutrient Profiles for maintenance. 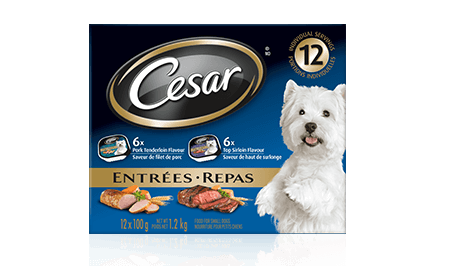 CESAR® Entrées Top Sirloin Flavour Food For Small Dogs is formulated to meet the nutritional levels established by the AAFCO Dog Food Nutrient Profiles for maintenance.